The Intel® Next-Gen Wireless-N 7260 802.11n, dual band, 2x2 Wi-Fi adapter delivers faster speeds (up to 300 Mbps), greater range, and more reliability for a great mobile experience. Combined with 4th gen Intel® Core™ processors and exceptional Intel® ...wireless innovations, the Intel® Next-Gen Wireless-N 7260 dramatically reshapes your connected experience at work, home, or on the go. Delivers up to 300 Mbps speed with dual streams (2x2) for better performance and connectivity in more places, through more walls, doors, and floors. Use the power of dual band 5 GHz to boost speeds and reduce congestion compared to older 2.4 GHz networks and devices. Single sided HMC and M.2 modules support multiple connectors for flexible system configuration and platform usages. The new M.2 form factor delivers a smaller, lower profile, more flexible form factor for thin-and-light Ultrabook™, notebook, and tablet designs. 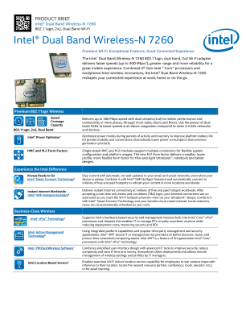 Read the full Intel® Next-Gen Wireless-N 7260, Dual Band Wi-Fi Product Brief.